Looking forward from the helm, taken while I was standing on the helmsman's seat. 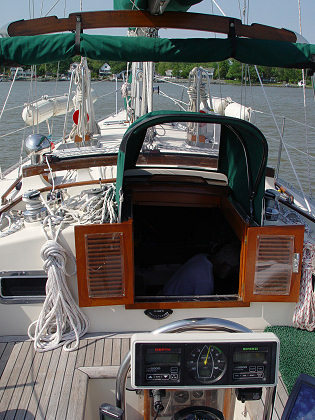 Due to the small companionway hood and the normally rolled-up cockpit awning, you have excellent visibility all around from the helm. The downside is that the helmsman is standing out in the weather and full sunlight. The companionway doors are easily removed; there's a set of drop boards that can be installed instead. 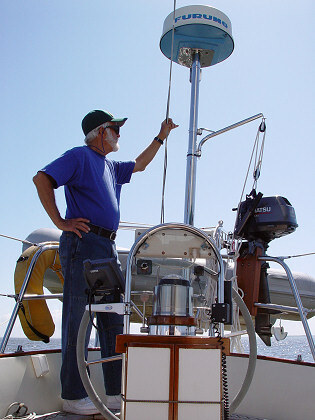 The helm and related gadgets. 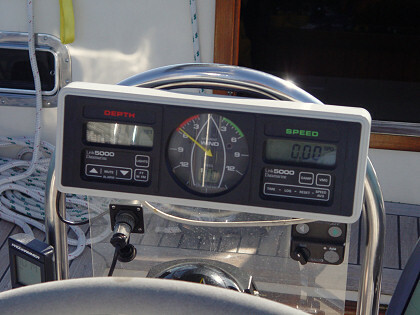 Directly above the compass is a multipurpose instrument with displays for depth sounder, knot meter, wind speed, and wind direction. 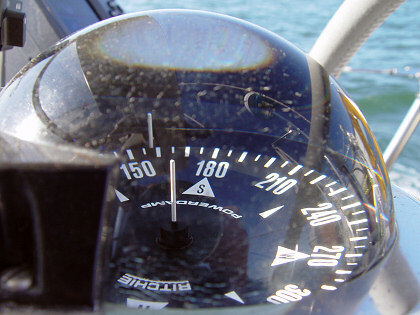 The black handheld device to the left of the compass is the remote control for the autopilot. To the right of the compass is the Garmin GPS. A slightly different view of the helm. You can see how the cockpit seat flares out aft of the wheel. 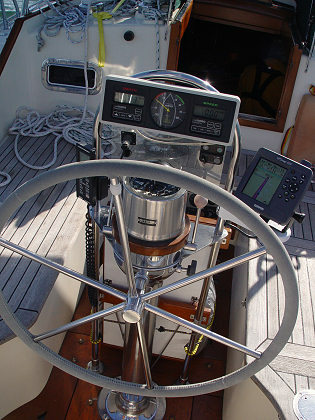 The helmsman's seat is quite comfortable and the cockpit coaming provides a good backrest. However, the rest of the cockpit seating is quite wide, and it's awkward to use the coaming as a backrest. Directly behind the pedestal you can see the folded up cockpit table. We stored the Honda generator on the cockpit sole just ahead of the table, covered and strapped to the pedestal grab rails. 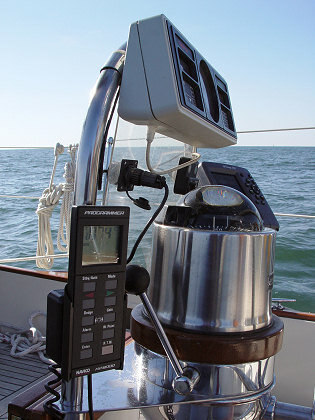 The multipurpose instrument with displays for depth sounder, knot meter, wind speed, and wind direction. The knot meter and wind speed displays are temporarily out of service. 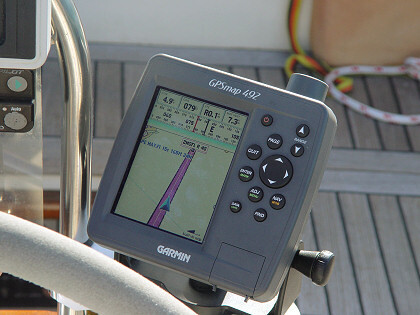 The brand-new Garmin GPSmap 492, complete with nautical charts for the entire known universe (so it seems). As someone very comfortable with computerized gadgets, I spent a lot of time playing with the GPS to figure it out and provide usability tips to Jerome. 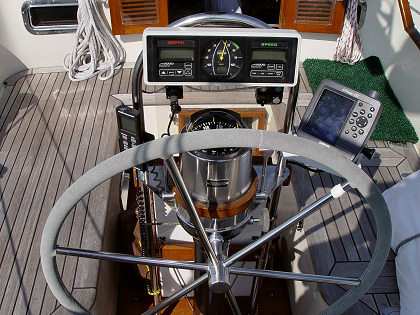 The black object to the left of the binnacle is the remote control for the Navico autopilot. The rest of the autopilot is below the cockpit, including the electric hydraulic pump and steering actuator plus other circuitry. For the most part, the autopilot worked well. Peering into the compass—'round and 'round she goes, where she stops, nobody knows (except the helmsman, hopefully). Jerome keeping watch, taken from the companionway while we were sailing on the bay. You get a good view of the radar pole and outboard motor crane. The motor itself is clamped to a wooden bracket that is mounted on the pulpit frame. The white object at bottom center is the underside of the folded-up cockpit table. The story continues after one more page of pictures.